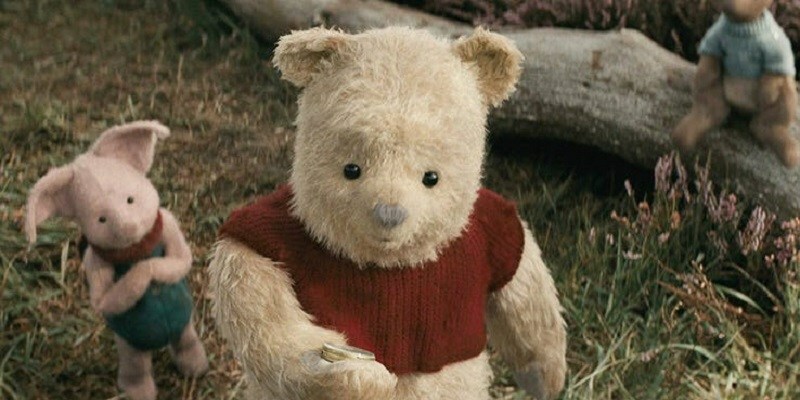 Thank you, Disney, for helping us Winnie the Pooh fans to forget last year's snoozer drama, Goodbye Christopher Robin. The one thing we don't need to see is another film covering all of the depressing reasons an author created a beloved children's book character. Christopher Robin is at least a novel approach to the silly ol' honey-loving bear, bringing him into the live-action realm with a story that has the joyful adventure of the Paddington movies, with just enough melancholy to pack an emotional punch. Disney, who have been adapting Milne's character into cartoons for decades, and delivered the remarkably faithful 2011 animated film, have delivered a honey pot of a film that fans of Pooh are going to adore. Directed by Finding Neverland's Marc Forster, Christopher Robin stars Ewan McGregor as the title character, a boy who spent his childhood playing in the idyllic Hundred Acre Wood with his animal pals. Pooh, Tigger, Piglet, Roo, Eeyore, Owl, Rabbit, Kanga...all are seen bearing striking resemblance to the actual stuffed animal toys the real-life Christopher Robin played with. It's a remarkable recreation, drawing further inspiration from the illustrations by artist E.H. Shepard. Assuming rightly that we already know the story of Winnie the Pooh, the film quickly pages storybook-style through Robin's youth, until he grows old enough that he must finally leave the Hundred Acre Wood and his anthropomorphic friends behind. It's a time of great sadness, although a party with cake and honey makes things a bit better, along with a promise from Robin that he will never forget Pooh or his pals. Of course, adulthood has a way of making liars of all of us. Robin (now played by Ewan McGregor) endures a series of tragedies, including a time spent fighting in the WWII. He meets his wife, Evelyn (Hayley Atwell) and has a daughter, Madeline (Bronte Carmichael). Robin gets a boring job as an efficiency manager at a luggage company, tasked with reducing costs by firing his co-workers. The pressure of adulthood has made Robin a sullen workaholic who has forgotten the time when he used to play and dream, and only Pooh can reawaken that child within him. When Pooh steps into a tree and ends up on a park bench near Robin's London home, the reunion isn't as joyful as one might expect. There's a recognition, at least in the beginning, that Pooh's childlike wonder could never understand Robin's stressful existence, and vice versa. Interestingly, the script is credited to three vastly different writers. Alex Ross Perry, who is best known for caustic dramas like Listen Up, Philip and Queen of Earth; Spotlight writer Tom McCarthy; and Hidden Figures writer Alison Schroeder all worked on the screenplay, bringing their various strengths to the table. Perry's gift for humor is captured in the mirthful Pooh, who is never far from a thought about his rumbling tummy. But when Pooh-bear manages to take his thoughts off of honey, he's frequently mournful over what's become of Robin. He still sees the boy he befriended as a child, and it takes a great deal of work to bring that part of him back. It's a lot of work for the screenplay to get there, too. Robin's life is so full of sadness that some may find it dull or depressing, but the wait is worth it when Tigger and Co. come literally bouncing back into the story. Because that's what Tigger's do...they bounce. And they're the best at it. Iconic aspects of Milne's beloved stories are lovingly reinterpreted in ways that are a constant treat: Pooh's red balloon, Tigger's "The Wonderful Thing About Tiggers" song, and many more. Visually, Christopher Robin is a treat for the eyes, with Disney sparing no expense to recreate the look of the era. Most importantly, the Hundred Acre Wood is a great natural canvas that any child could turn into their own amusement park. While the London scenes are pretty drab, they are spruced up by a score that includes classic Pooh songs from the Sherman Brothers, and the familiar Pooh theme that will have you humming along. Disney continues to do right by Winnie the Pooh, and I love that Winnie the Pooh isn't just another remake, or a reboot, or some Disney XD series. There's real imagination put into crafting an original story that will hopefully reintroduce Milne's characters to a new generation, and spark a familiar feeling of wonderment in the old.